← Yeast hybridization: a solution for biodiversity conservation? Thanks to developments in biotechnology it is possible nowadays to produce chemicals through biological ways, therefore avoiding the use of non-renewable sources, such as petroleum. In order to produce compounds through biological processes, microorganisms have been modified and engineered. The main aim of the whole process underlying metabolic engineering approach is to identify the essential enzymes required for the production of specific compounds and make them available in the host cell and improve their activity. So far, engineering of metabolic pathways has relied on in vitro techniques that can lead to the production of improved enzymes, for example with more substrate specificity or better kinetic properties. Thanks to directed protein evolution, it is possible to generate libraries of protein variants which then will have to be screened for their functional activity and desired features. An interesting approach is also a coupling of mutation and gene shuffling cycles but all of these in vitro techniques can be applied to DNA sequences of maximum 5 kb. Therefore this strategy is not applicable to in vitro shuffling of pathways, that are usually composed of gene clusters that overcome 10 kb. (Fujii et al., 2006; Gupta and Tawﬁk, 2008; Khersonsky et al., 2009; Romanini et al., 2012). Luque et al., 2014, have worked on the possibility to evolve metabolic pathways in vivo, therefore producing functional libraries of pathways, under physiological conditions. According to previous studies, an interesting characteristic of Saccharomyces cerevisiae has been exploited. Wild type S. cerevisiae is generally able to perform homologous recombination between identical sequences and with less efficiency, between homeologous sequences, which are non-identical sequences (Mézard et al., 1992). Enhancing the ability of S. cerevisiae to perform recombination between similar sequences, such as homeologous genes, it would allow to generate chimeric genes with higher efficiency. A. Luque and coworkers took advantage of this feature, proven to be existent S. cerevisiae strain deficient of msh2 and sgs1, involved in DNA repair mechanism (Datta et al., 1996. Pandjaitan and Luque, 2011). Through their study, Luque et al., 2014 were able to integrate into the genome of S. cerevisiae the flavonoid metabolic pathway, completely heterologous, and to generate in vivo functional libraries. They chose 2 parental clusters of the 8 genes of the flavonoid pathway (PAL, C4H, CPR, 4CL, CHS CHI, F3H, FLS) named F1 and F2. As each couple of genes (CPR excluded) is composed by genes derived from different plant sources, they would differ from each other for some nucleotides: they are homeologous fragments. This feature, in DNA repair deficient strains, will allow recombination events and the in vivo production of chimeric genes (Fig.1 and Fig.2). After the recombination events and pathway integration in the genome, the strains were mated with their respective wild type mater, so that their ability to repair DNA was restored. Then, few selected strains were analyzed through PCR, sequencing and metabolic profiles. 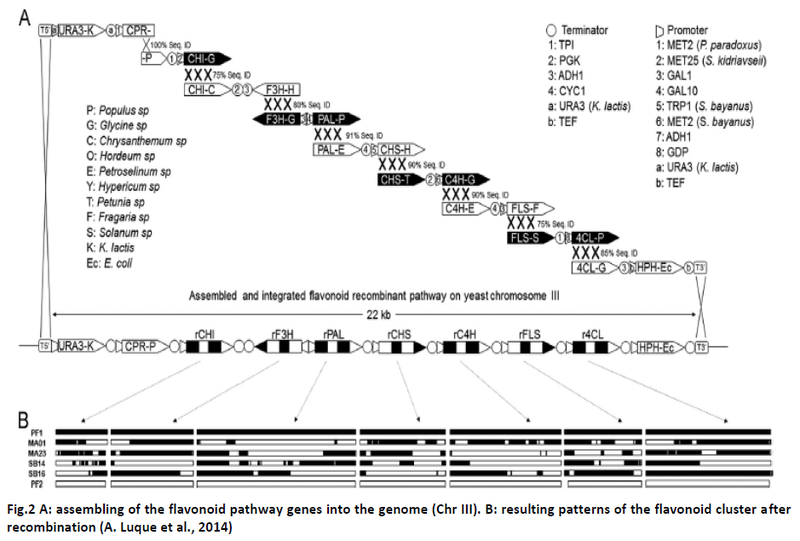 Noteworthy is that the strains taken under consideration were able to produce intermediates of the flavonoid pathway and they all carried functional clusters of the pathway, without insertion or deletions. Moreover, the recombination events between the homeologous sequences were always different among the analyzed strains and varied in numbers and locations. This work opens the possibility of a different approach for metabolic engineering studies. Creating in vivo functional libraries of heterologous pathways in yeast showed to be an interesting and successful method to enhance the functionality of the pathway. Datta, A., Adjiri, A., New, L., Crouse, G.F., Jinks Robertson, S., 1996. Mitotic crossovers between diverged sequences are regulated by mismatch repair proteins in Saccaromyces cerevisiae. Mol. Cell. Biol. 16, 1085–1093. Fujii, R., Kitaoka, M., Hayashi, K., 2006. RAISE: a simple and novel method of generating random insertion and deletion mutations. Nucleic Acids Res. 34, e30. Gupta, R.D., Tawﬁk, D.S., 2008. Directed enzyme evolution via small and effective neutral drift libraries. Nat. Methods 5, 939–942. Khersonsky, O., Rosenblat, M., Toker, L., Yacobson, S., Hugenmatter, A., Silman, I., Sussman, J.L., Aviram, M., Tawﬁk, D.S., 2009. Directed evolution of serum paraoxonase PON3 by family shufﬂing and ancestor/consensus mutagenesis, and its biochemical characterization. Biochemistry 48, 6644–6654. Mézard, C., Pompon, D., Nicolas, A., 1992. Recombination between similar but not identical DNA sequences during yeast transformation occurs within short stretches of identity. Cell 70, 659–670. Pandjaitan, R., Luque, A., 2011. Methods Generating Gene Mosaics. Patent no. WO2011124693A1. Romanini, D.W., Peralta-Yahya, P., Mondol, V., Cornish, V.W., 2012. A heritable recombination system for synthetic Darwinian evolution in yeast. ACS Synth. Biol. 1, 602–609.